Michael O'Neill believes goalkeeper Bailey Peacock-Farrell will commit to Northern Ireland, even if he does not play against Bosnia and Herzegovina on Saturday. 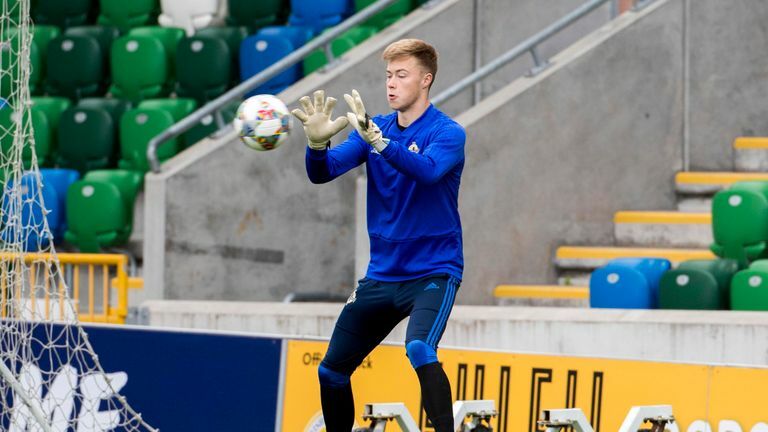 The 21-year-old goalkeeper has been included in O'Neill squad for their UEFA Nations League opener, live on Sky Sports Football, and this week revealed he had turned down overtures to switch allegiance to England. A competitive appearance at Windsor Park on Saturday would close the door on that permanently. "That's always a factor," O'Neill said of his selection. "But I will pick the goalkeeper I think deserves to play. I don't think we will lose Bailey, he's committed. We found Bailey when he was potential and nothing more than that. He has done an awful lot off his own back to get where he is now and be first choice at Leeds. "This is a competitive game with a route that we've talked about to Euro 2020, so the goalkeeper that is picked on Saturday will be the goalkeeper that deserves to play." Peacock-Farrell, who qualifies for Northern Ireland through his grandfather, made his senior international debut in May in a friendly against Panama. "When you find a young player with potential you have to give them time and the people on our staff have done that," said O'Neill. "We found Bailey when he was potential and nothing more than that. He has done an awful lot off his own back to get where he is now and be first choice at Leeds." O'Neill will be without Chris Brunt and Aaron Hughes as they chase only their second win in eight games, while Gareth McAuley is unlikely to feature having not played yet this season. With away games against Austria and Bosnia to come in October, Northern Ireland skipper Steven Davis says they must capitalise on Saturday's home fixture in what is expected to be a tight Nations League group. "You always want to build momentum straight away," he said. "If you can do that with a small number of games you put yourself in a strong position early on. "It's a good challenge for us against a good team with a couple of top quality players. You want to test yourself against the best. "We want to make our home games a fortress as we have done before."